"I'm totally self taught, I never went to school for this," says Ken Griswa, a Berkeley, CA based copper artist who has been creating a diverse body of handmade copper art work since 1997. Outdoor, interior and custom work defines his unique, playful approach to crafting unique copper pieces for private clients and public spaces. As with anyone with an artistic bent, a foundation during childhood set the stage for Griswa's creative life. "My mother was a master gardener," he says. "A large part of her gardens were art pieces; plant pots, unique pottery, things that hung on the wall." The idea of sculpture and adornment permeated her gardens. Griswa's mother and father were avid art collectors, looking to place original, one-of-a-kind work in their home. With that kind of environment, it's no wonder that he gravitated toward creating his own work. "I fell into copper by spiritual intervention," he muses. "I was educated as a geographer and cartographer and was trained in pen and ink." It was during school that a central moment began to define his work. "What got me going was a book written in the early 1900s," he recalls. "It was about 20 pages and it showed how to make a tea tray from a single sheet of copper." After he made the tray, he realized the limitless power of copper. He defines himself as a 'creationist' not an 'artist' due to the fact that when he meets with clients, it's an act of creation which solves their problems. "It's like I start to divine weird stories and visions," he says. "Those things end up in the pieces and when I deliver it the client is blown away." Though it sounds almost ethereal, there is a solid practical side to Griswa's work. "Most of my stuff has a hidden functionality," he says. "One piece was a giant fountain that was meant to conceal but not constrict a heat vent for a gas fireplace that protruded into a foyer." The building code prohibited any altering of the vent. So he created a fountain from a single sheet of copper, which bows around the vent giving a practical and aesthetic value. "So when you're in the foyer you don't see this big aluminum vent that says 'hot' on it," he jokes. "My specialty is custom and that's how I fell into working with copper." Being in the confines of the San Francisco Bay area, where space is at a premium, he was asked by clients to hide the visual vulgarities of everyday life. "'I want to conceal the view of that parking lot', they would say, or they desired to hide vents or wall speakers where sound could still pass through, but still adorn, the straight lines, boxes and rectangles that we've created---and copper fit the bill.," he says. "Look how it comes; sheet, rod, plate, wire, foil. It's the diversity and malleability of copper that drives him to experiment with it. "I'm known for my firing patinas , where I take a 4 x 10 sheet, fire it to 1,100 degrees then drag a wet cloth across it," he confides. "It's this alchemy moment as the steam rises. The patinas created by the fire, these oranges, Tuscan browns and crimson reds are unbelievable." 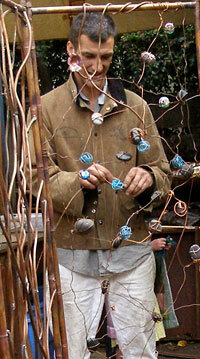 Some of his public work has been with the City of Benicia in Northern California for example, where he taught 4th graders how to make a tea tray from copper sheet, or a flower from copper wire. He loves to introduce them to the malleability of the metal. Though people give him old copper to use; pipes, wire, gutters, old backsplashes for instance, he buys his new copper sheet from Metal Service Center in Windsor, CA. "That's one of the coolest things about copper," he adds, "it has a payback value, it's recyclable. Copper can live in a full circle of life, it can reconverted into another usable form." He hopes his work speaks to those willing to listen to copper's own personality. "If what I've done inspires someone else, that's cool," he says.